In short, this is an excellent young adult thriller that is a must-read for fans of complex heroines with special skills battling against forces that look to control her life. You're thinking - 'oh, like The Hunger Games', right? And while this series-starting novel from a debut author has some echoes of that popular young adult series, it is no homage or pastiche. Instead, more akin to a rock or pop band that has influences, but puts their own spin on things, building their own distinct sound and voice. 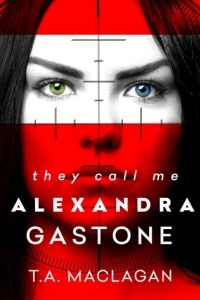 Teenager Alexandra "Lex" Gladstone has a fairly typical life in some ways - high school, boyfriend, college applications, doting grandfather - but in other ways she's completely unique.. Not just for her two eyes of different colours. Although they certainly played a part in the twists her life took. Years ago Lex was Milena, a ballet-loving young girl in Olissa, a nation-state that has been battled over by the Russians, Iran, America and others. Recruited to Perun, a top training academy for spies, she was groomed as a sleeper agent for years, indoctrinated to the quest for Olissian independence, then inserted into her mission: replacing the real Lex Gladstone, who died in a tragic car crash with her parents. The switch came at a high cost: her family was left behind when she entered Perun, then 'becoming Lex' involved painful cosmetic surgery, then an even more brutal attack from her handlers so her injuries matched the car crash. Milena/Lex is then raised by Albert, her lovable American grandfather, who himself works for the CIA. She doesn't know when she will be called on to activate and undertake a mission. Until then, she's a regular American teenage girl. Even if she keeps everyone at distance, including her new boyfriend Grant. Struggling to find her place in the world, as a young woman who years ago promised her fealty to Perun and Olissa. Then Lex gets her mission: assassinate the US-friendly President of Olissa, who won a controversial election ahead of Perun's preferred candidate, and pin the blame on her grandfather. She'll have to kill, then go to jail, before being sprung in future; scorched-earth on her adopted life, and devastating the man who's raised her. For the blood of the fallen. For the blood of the living. For Olissa, we fight. TA MacLagan weaves a page-turning tale, that is slickly written, and full of intrigue both in terms of the twisting plotline, and the character of Lex herself. An accomplished and highly trained young woman who battles with herself and where she fits, just like any teenager. Who tries to find a balance between her mission and her life. She's had to hold herself back and hide the real her for many years, but now has to pick a side. There are an interesting cast of characters orbiting around Lex, from her doting grandfather Albert, to her friends and teachers at school, and her mentors, handlers, and peers when she recalls her times at Perun. There's enough 'meat on the bones' of each character, even in small roles, that things never seem caricature-ish - each has their own life and motivations, and seem like real people (even if caught up in a fantastical thriller world), rather than chess pieces being moved around by an obvious authorial hand. This is a young adult tale, so I read it with that in mind. The story flows well, with plenty of intrigue and action, and characters that you grow to care about, and want to see again. Plus some nice twists.